Nearly twelve months into my residency training, I learned that one of my best friends from medical school died at the age of 28. Through all the grief of losing a close friend, and the sorrow I felt for his family, I couldn't help shake a nagging question that washed over me in waves, particularly in days where I was overwhelmed or burnt-out as a trainee, and one that I felt guilty even having: “was it worth it?” Was it worth it for him to go through years of exhaustive medical training that consumed the majority of his life, only for it to be taken away so close to the ultimate realization of all of his efforts. In hindsight, it was not really a question I was asking of his life, but of mine. Was it worth striving so hard through residency knowing that at any time, I may meet the same untimely fate? Reading through Paul Kalanithi’s new memoir, When Breath Becomes Air, I could not help but think of this question. 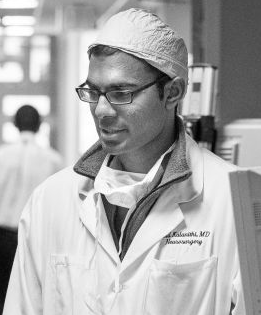 Kalanithi was in his final year of training as a neurosurgeon, probably one of the most arduous and lengthy career paths one can take in medicine, when he was diagnosed with widely metastatic lung cancer. The book chronicles how his life changed after receiving the diagnosis, one that he knew was terminal despite his oncologists unwavering resistance to give him a prognosis. He writes eloquently about how hope, denial, the prospect of death, and the ever changing perception of time is felt by someone living with a disease that has its ebbs and flows, but ultimately is relentless in its progression. The book is both incredibly magnificent and tragically sad, but at no point do you ever feel pity, as his strength appears to only grow as his body becomes more frail. "Years ago, it had occurred to me that Darwin and Nietzsche agreed on one thing: the defining characteristic of the organism is striving. Describing life otherwise was like painting a tiger without its strips." I am not sure I would have the same unwavering dedication to my professional career as Kalanithi did when he decided to continue with his neurosurgical training after his diagnosis. With that said, Kalanithi’s book serves as a reminder that striving to bring meaning and purpose to ones life can take many forms. The challenge is to be "neither blind to, nor bound by, death's approach." I received this book a day prior to release, and could not put it down. It is mandatory reading for everyone, it reminds us why we went into medicine, nursing, social work, etc, and why the sick person is the most important aspect of health care...not the disease. Loved this article. Thanks so much for sharing. The death of our beloved give us the great stress on our minds and that stress becomes the reason of many pains whether mental or physical. The best way to reduce pain and become normal is Physiotherapy North Ryde and I am sure you will try your best to come back to your life because I have also gone through the same situation when one of my best friend died in a very early age of just 18.